Staff selection commission (SSC has recently published jobs notification for the SSC PHASE-6, 1136 posts. Those candidates who are interested in this vacancy they can fill up from 05-09-2018 last date of apply 30-09-2018. 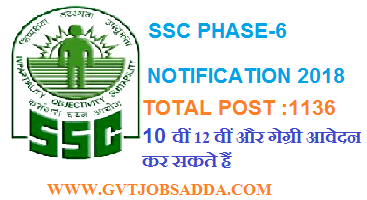 Note : read official notification before online apply for SSC PHASE-6. For more detailed information about Educational Qualification & Age limit in STAFF SELECTION COMMISSION PHASE-VI RECRUITMENT 2018 candidate can check the Official Notification. Links given below.